Bing, Microsoft's search engine is taking a note out of sister brand Skype and incorporating their technology into their search platform. Unfortunately, this test has only rolled out to a select section of search, so no need to get too excited just yet. 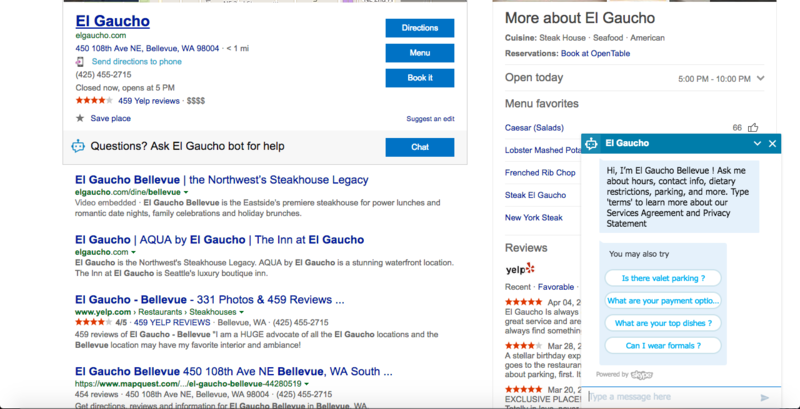 Bing has rolled out a chatbot to help users with some of its local search results for restaurants in the Seattle area. Since this is a control test you won't be able to access this using conventional Bing search outside the US. I was, however, able to recreate it and use the bot chat myself by accessing Bing via VPN. If you're really keen on trying it out and you're outside the US simply download a VPN extension for your preferred browser and set it to the US. The new feature appears at the bottom of the local knowledge graph listing for some individual restaurants in the cities of Redmond (where Microsoft is based) and nearby Bellevue, Washington — both are just outside of Seattle. I could only replicate it in traditional search and not map search which I felt as lacking since these searches are all based on local locations. I’ve tried it out on 6 different searches for specific restaurants, such as Monsoon in Bellevue and El Gaucho. If the restaurant as a local knowledge graph listing you will find below the regular business information is an invitation — Questions? 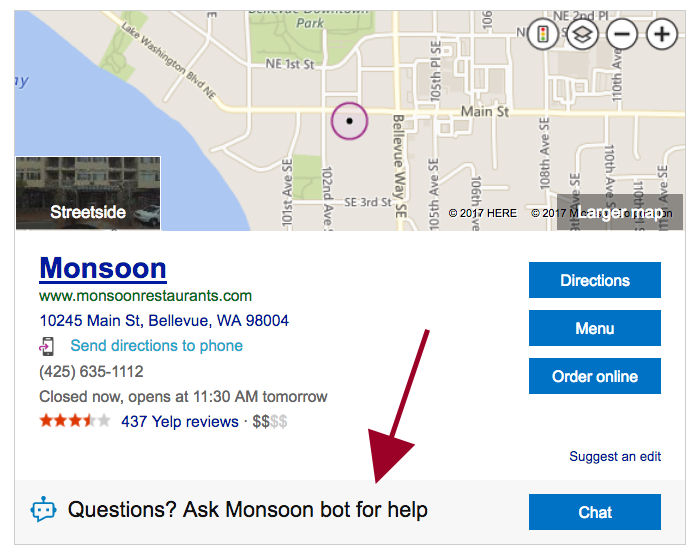 Ask *restaurant name* bot for help — with a “Chat” call-to-action button to the right. What can this chatbot do? Show me the directions to your place? What parking options you have? What dishes do you recommend? and a few more. You may want to play around and discover for yourself, also feel free to share your findings in the comments section below and we will add it to the list. The chat was semi-helpful as is often the case when dealing with chatbots, it just simply isn't human interaction and we can sense that. You have to learn how to phrase things if you’re not going to use the suggested questions. At this point, Bing has been pretty silent on the functionality. We don’t know if this is a limited test or something that’s live for anyone to use. We don’t know if it’s purposely active only for restaurants near Bing’s headquarters. We also don’t know if Bing has plans to use this chatbot feature more widely in the future. However, we will keep tabs on this and keep you up to date should Bing provide additional information or begin to roll it out on a larger scale. These search bots could be the next step in search engine marketing as SERPs become dominated with optimised content and finding relevant long tail answers. We've seen the rise in the long tail and semantic search in recent years, we've seen the increase in search refinements because users want their questions answered immediately. Rich chards, answer boxes, knowledge graphs have all been hugely popular in satisfying users who crave instant information and in turn, chatbots could be seen as the natural progression of this trend. I have no doubt social bots and search bots will become common practice in the near future. As the technology is refined and developed, as machine learning algorithms improve it will only get better at understanding what we want from them and from search or social.